• DESCRIPTION: BHS RC 200 Hydraulic powered Top Head Drive capable of drilling 5” & 5 ½” diameter Holes up to a depth of 200 meters for exploration purposes by RC Drilling Method and & 6” -6 ½” diameter holes upto a depth of 200 meters by AIR-DTH Drilling Method. Reverse circulation drill rig capable of drilling 200 mtrs, for exploration drilling MODEL BHS RC-200 consists of Ashok Leyland Taurus Truck Model 2516/AMW 2518/ Equivalent, Top head drive unit, with Diesel powered Deck Engine driven hydraulics, 1 Ton auxiliary winch, water/ foam injection system, drill rod break out system, Hydraulic oil cooler assembly, sample collection cyclone, provision to carry the drill rods on platform etc. 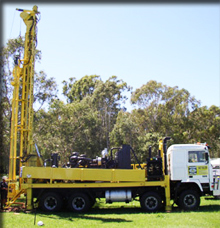 • CAPACITY: The rig is capable of drilling upto 5”-5 ½” dia holes for exploration purposes, by RC Drilling method to a depth of 200 meters. • MAST: The Mast /Tower is of C cross section type and made of heavy duty rectangular section, reinforced with suitable cross members, capable of handling 6.1 meters drill rods. • TOP DRIVE ROTARY HEAD: Hydraulically operated Top Drive Rotary head powered by two Hydraulic Motors and having variable speed range of 0-150 rpm and capable of giving a torque of approx. 40,000 in-lbs. • AIR SWIVEL: A separate air swivel is provided on the in rotary head. • SAMPLE SWIVEL: A Sample swivel along with blow-down arrangement is provided. • FEED SYSTEM: Heavy duty, high strength, hydraulic cylinder is provided to accommodate 6 mtrs (20feet) long drill pipes and to handle 6Mtrs casing pipes. The pull back is of about 18,000 lbs and the pull down capacity to be 10,000 LBS. The feed system is actuated using hydraulic cylinder and wire rope system. The feed system incorporate arrangement to control and limit weight on the Drill Bit. Rapid and slow feed speed arrangement is provided to measure the down feed and hold back pressure of the system. • HYDRAULIC SYSTEM: An efficiently designed hydraulic system is provided to operate rotation, feed, jacks, mast raising cylinders, Break out wrenches, and Water/Foam injection pump. The system is operated with Deck Engine through the transfer gear box. The hydraulic system includes fin type Hydraulic oil cooler with a capacity of 95GPM suitable for 50 deg. Centigrade ambient, high pressure hydraulic hoses, control valves, gauges etc. for efficient operations. Hydraulic reservoir of capacity 650ltrs located conveniently, suction strainer is provided to avoid any foreign particle entering the suction line and the pump return line is provided, filtration with 40micron element. Hydraulic tandem gear/piston pumps are used for the purpose of rotation, feed, micro feed and auxiliary systems. • STABILIZERS (JACKS): Hydraulically operated leveling jacks of 125 x 70 x 700 (stroke) protected with covers 4 numbers is provided with suitable leveling arrangement and double lock check valves (locking device) and is located at convenient place for fast and accurate leveling. • BREAK OUT SYSTEM: Break out Wrench: Hydraulic break out wrench cylinder is provided with provision of opening drill pipe, hammer, button bits etc on the centralizer drill table using appropriate wrenches/tools. Stroke of 350mm, torque 200kgm (approximately) is provided with rope attached. • SWINGOUT CENTRALISER TABLE: The working table /centralizer will have a minimum table opening of 420mm. The centralizer table is set above the truck chassis to prevent the drill cuttings falling back into the hole. • DUST CURTAIN: A rubberized curtain (dust curtain) is provided to protect the operators from falling of stone cuttings or splashing of water during drilling or flushing. • AUX WINCH: The mast is equipped with the hydraulically operated winch having jib boom for handling of drill pipes, hammers, casing pipes and heavy tools. The rated capacity of the hydraulic hoist shall be of 1000Kg with built in brakes and is operated simultaneously while drilling is carried out for handling drill pipes etc. • ROD CHANGING DEVICE : Manual operated single rod changer will be provided for changing the drill pipes, how ever a rod changing mechanism for fast makeup and brake out of drill string can be provided as optional. • WATER AND FOAM INJECTION: Triplex reciprocating Hydraulically operated pump of capacity of 100 LPM at 1500PSI complete with necessary piping including a flow metering valve. The pump is capable of pumping water and foam mixture complete with necessary hoses and fittings. Minimum 300liters. Capacity of water tank is provided. A washing hose having connection from water injection pump with nozzles etc. is provided for washing Rig. • AIR LINE LUBRICATOR: An inline oiler of 15 liters capacity and suitable for working pressure up to 500 PSI is provided for injecting oil in all compressed air stream complete with volume control provided. • CONTROL PANEL: Centralized control panel is located at convenient place on the drill to enable the driller for efficient control of the operation. All levers, valves and gauges are conveniently grouped. The control for setting up of rig is grouped in such a way to prevent accidental operation while drilling. A lockable steel cover (control panel cover) is provided for the control panel to protect gauges and controls during transportation. Gauges to include rotation control feed control, hold back control, air pressure control and includes emergency shut down switch for the engine. • BLOADER: A Hydro-pneumatic combination Bloader assembly is provided on the Rotary head to facilitate the blowout the blockages in the sample tube. • CYCLONE: A 250 letters capacity cyclone type collector for sample recovery is provided. • SPLITTER: A well designed splitter for 50 Litters capacity is provided for sampling/ recovery for analysis. • LIGHTING SYSTEM: The electrical system of the rig is 12/24 V AC/DC system connected to the batteries of the rig engine. The system is provided on panel and instrument illuminating light and minimum three spot is directed at the mast and rotation. • DRILLERS AND OPERATORS PLATFORM: A suitable folding working platform (full length) is provided for the operator and the helper. • DRILL PIPE RACK: Suitable arrangement is made to carry the drill rods on both sides of the platform on the truck. • HAMMER BOX: Suitable lockable boxes are provided for keeping hammers, bits, tools etc. separately. • TOOLS BOX: Suitable tools box with necessary tools generally required for drilling is provided.